I am new to RC airplanes, and now I am just starting on Flite Test's Swappable Series Spitfire. I am running into a problem with centering the servos and would like somebody's help. For the Spitfire build, I bought the Power Pack C as suggested on the website. The C pack came with EMax ES08A II servos which have Voltage spec of 4.8-6.0V. I also bought LiPo battery with specs 3S/11.1V 2100mAh. This was the closest thing to the battery spec posted on the Spitfire page. One of the Flite Test's "how to" YouTube videos explains how to center the servos, but we did not realize that you should use "2S" battery pack to do this. So we used the 3S pack we bought and ended up frying one of the servos. Given that we bought the servos/battery pack that was suggested on the Spitfire page, I didn't even realize that I am supposed to use a battery pack of difference cell size just to center the servos. Am I understanding this correctly? And once the servos are centered and connected to the receiver, I can use 3S battery, even though the servos can take direct energy only from 2S battery, correct?? Centering the servos is simple. You can use your radio gear to do so. Firstly centre all of the trims on your transmotter and then plug the servos into your Rx. Plug the ESC into the Rx, (you do not need to connect the motor because it is safer if you do not at this time). Connect the battery to the ESC and everything should power up. Go through the binding procedure if the Rx is not bound. With the transmitter on and the Rx powered up the servos will travel to the centre position. Once centred you can fit the servo output arms to give the correct range of movement. Nominally equal positive and negative travel. As for using a 2S battery to power up the servos I recommend that you use caution as not all servos can handle 7 to 8 volts without damage! The ESC supplies 5V to the Rx and the Servos are connected to the same voltage when plugged into the Rx. I spent roughly $15 at Amazon and got a 4AA battery pack and servo tester/centering tool; WELL worth the $$$. The servo tester has 3 settings on it - manual mode, where I can use a dial to move the servo through its range; center, where it centers the servo; and auto range testing, where it slowly moves the servo repeatedly through its range. If you watch the FT Sea Duck build, the servo tester I have looks very similar to the one Josh uses to center the servos. 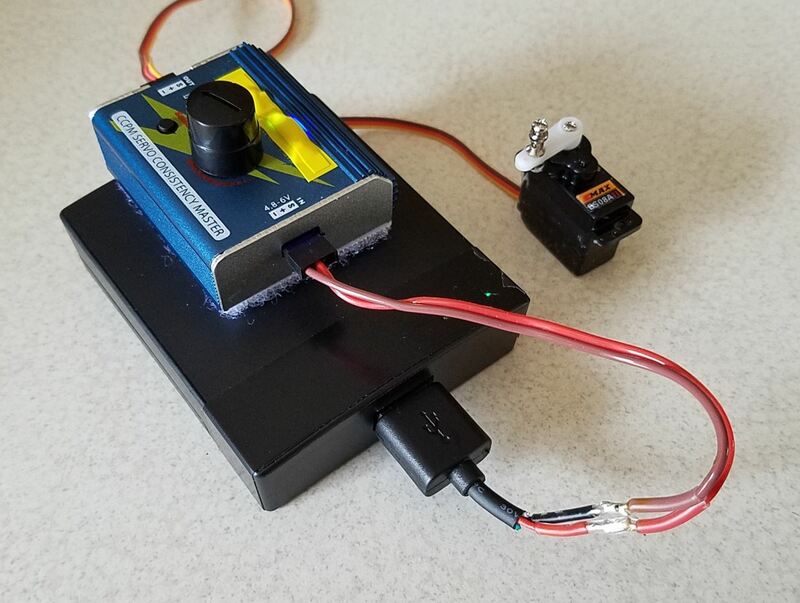 If you plan on doing more of these builds, buy the servo tester - it's a lot easier to use than having to bind up a receiver, connect an ESC/BEC that may require soldering of connectors, etc. One other nice thing about this combination is that the battery pack connector is "idiot proof", since it has a Futaba style connector, and the RMRC servo tester has a notch cut out for the Futaba connection, and you won't run the risk of frying your servos with the wrong size battery. +1 for the servo tester. For power I attached a Futaba style connector to one end of a USB cable. It can be plugged into any USB port or charger. Nice! I hadn't thought of doing that, but it could be a good thing. Only time I can see it potentially being an issue is if you're out in the field and need to test a potentially bad servo. Then you'd have to have one of those cell phone battery packs to run it off of...But that's easy enough to deal with. Here is the servo tester that I rigged up. It will provide a steady 5 volts for the servos. You can even use it to power up an Rx with the servos connected. The servo tester is just attached to the top of the phone charger with Velcro. The phone charger uses 4 AA batteries. I cut the end off of a USB cable and the cable off of an old servo and soldered them together. Oh yeah...the yellow tape is on there to try to block the retina incinerating blue LEDs. I have no idea how an electrical engineer can look at those lights and say "well, this amount of light seems reasonable". I thought about field charging also, the radio in my truck has a USB port. Also, you can get USB chargers that plug into the cigarette lighter, or as they call it now, "power port".